East off route 414 on Clyde Hunt Corner Road just north of Clyde NY. Look for a sign at the corner. The shop is on the right hand side of the road (first Amish place). 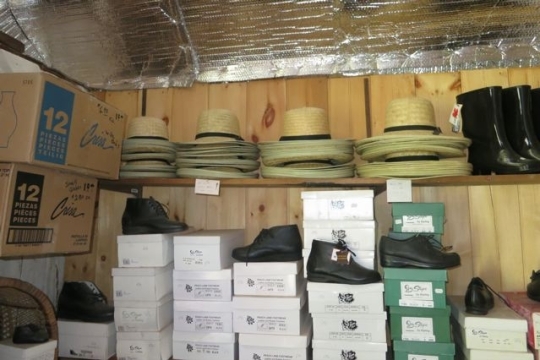 Tom lends a hand again today with some photos of an Amish shoe store in Clyde, NY. 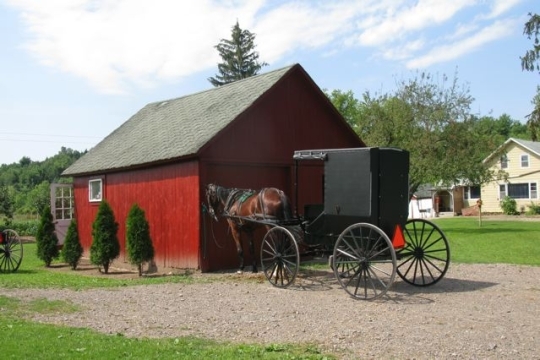 One of my favorite posts so far this year was the Amish shoe repair discussion from January. 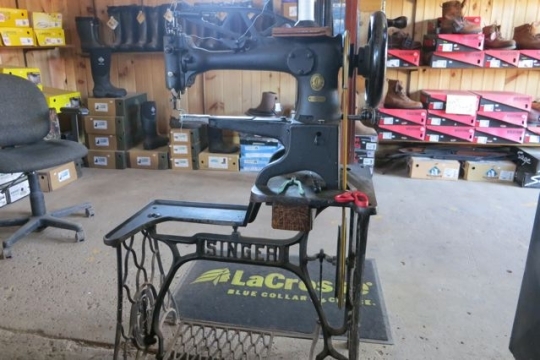 I learned a lot of you do take advantage of cobblers’ talents (both Amish and non-Amish), and like me there were also those who buy multiple pairs. My shoe is still leaky, so I’m just strategically using it on non-rainy days. And alas, after much searching they no longer sell that model anymore. Guess I should have bought 5 the first time. I love the smell of leather when I go into a store, too. There is just something about it. Where in Clyde is is the shoe store? I don’t live to far from Clyde. 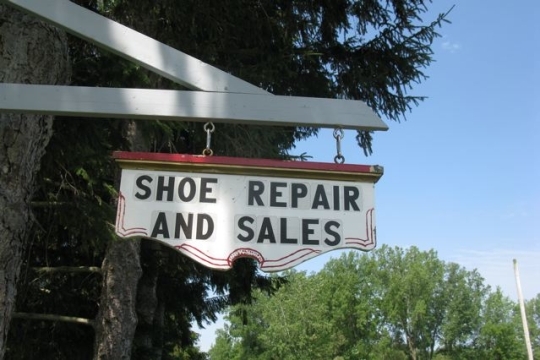 I wonder if they repair shoes, too? 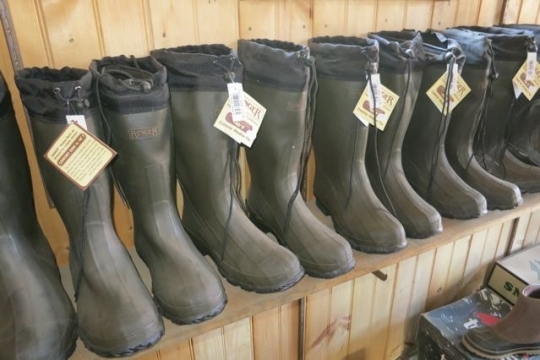 Sam Miller’s shoe shop is east off route 414 on Clyde Hunt Corner Road just north of Clyde NY. There is a sign at the corner and the shop is on the right hand side of the road (first Amish place). Marilyn, the sign says “Shoe Repair and Sales” so my guess is they repair too. I wish the old shoe cobbler here did not go out of business, I have several I would rather repair than throw out. But it seems the secular world is very much a “throw away” society. Seems we find it easier to throw things away rather than do regular maintenance and repair. I agree with the smell of leather, and other smells for that matter. They just give us a warm fuzzy when we smell them. Thanks Tom for all your wonderful pictures recently, I have truly enjoyed the posts!! IT IS SPRING TIME IN MICHIGAN! CROCUS BLOOM AND PEOPLE AREN'T WEARING SHOES! ! No shoes needed my feet feel better already. You are right, I should have read that sign better. I remember when I was a kid we use to have a shoe repairman in town. When you shoes got down-you took them to him. When he retired we had to go a couple of towns over. Now you can’t find a shoe repairman anywhere. With the cost of shoes today, especially if you like them, it would be nice to be able to take them and have them repaired. I may take a run up to Clyde and see if I can find him. I still use a cobbler to repair shoes. Also he will stretch shoes for me to fit better, due to a bunion on my toe. He will sit and chat with me a bit when I try the shoes on. He also loves to tease. Will always use a cobbler when I need one. I surprised my husband while dating and grabbed a pair of his favorite shoes, without his knowing and had new heels but on them. He sure was happy with that. Always best to repair a favorite pair of shoes than to throw them out. I literally feel like I have more energy at the end of the day (do a good bit of walking in PL with no car) and my heels are practically singing. When I was a high school kid I worked in a feed store. 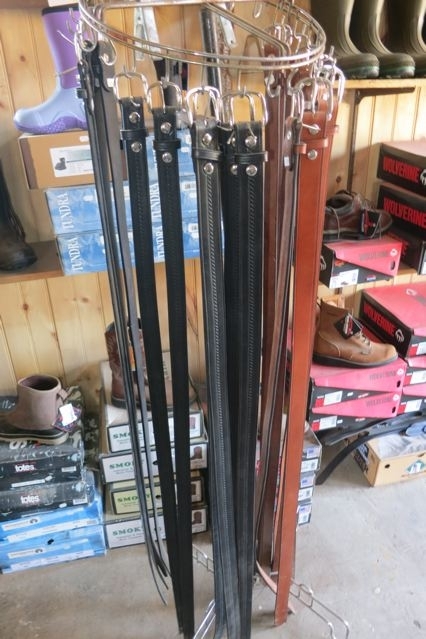 Located in the same building was a saddle shop. Red, the saddlesmith, repaired leather items (except footwear) and he also made custom belts, saddles and other leather items. I absolutely LOVED the smell of that shop. My boss had to come get me more than once because I went to visit with Red and couldn’t pull myself away. I sure wish that old man was still with us. One of my prized possessions is a 1928 model stock saddle that he restored in 1972. He basically rebuilt the whole saddle and then the customer wouldn’t pay for the repairs. My high school sweetheart bought it for me for a graduation present. The total including tax and all was a little over $40.0 dollars! They get twice that much just to clean and oil a saddle today. Good question Alice Mary. I was amazed when picking up some of the running shoes while in the store recently, they were so light they felt like they were molded from styrofoam peanuts. It doesn’t seem there’d be much “there” there to repair. Not bad for a $100+ price tag. Erik, that joke is a sure sign you’ve been hanging out with the Amish or eight year olds far too long. Of course, the computer term reboot does trace it’s origin back through some metaphors and phrases of speech back to the boot straps used by someone to pull on their own boots! I can’t help myself at this point Matt! Another issue with “real” shoes today is the declining quality of leather. I’ve read about this with harness makers. As most of our beef nowadays grows up fast in feedlots, they don’t develop the same quality hide that they used to when they lived a year or two longer and stayed out on the range. I’m guessing it’s like a lot of body parts, there is a prime age when you’re not too young and still growing, and not too old and declining (kind of like a young man around age 24 or a dog around the age of 3). Sure wish there were more shoe repair places. I think an Amish family that repairs shoes, sells quilts and so on could do very very well here in Tucson. There used to be 2 shoe repair places near where I live in Tucson (in last 5 years or so). One was run by old fellow who passed on. The other was opened by Australian brothers and they got a lot of business but didn’t make it. They repaired (resoled) a pair of shoes for me. John, since he’s Amish it’s doubtful Mr. Miller is going to see your message here. I’d just go by tomorrow AM and see if he’s in. This post is a couple years old but I’m assuming the store is still there. Hope he can fix your shoes! I just thought I’d post here very quickly that I love how old discussions get instant restarts when someone sees something they like or are interested in, and it pops up in the recent comments window. Given the date of the original posting I am not one hundred percent sure that I read this originally, but it is neat to see people still find a 2012 post relevant (we do see posts for as far back as 2007, if I’m not mistaken, get activity – its facinating). Shom – I agree 100%! Old posts get found all the time in the search engines. It’s neat to see comments float in a year or two later, like John’s here. I’m also gradually trying to refresh some of that older content through displaying it in widgets in the sidebar and at the bottom of the page, which are showing random and/or popular (highly commented) old posts (see the bottom of this page for an example). It takes some organizing though, and I’ve been gradually going back through old posts, sometimes re-categorizing them, and making other small improvements here and there. It’s time-consuming but actually kind of fun. To who this may concern, I’m looking for a size 21 EEEE Steel toed shoe or boot. Please call me back at 937 397 4020 or 937 938 7617. You can also reach me at 513 952 0846. Thanks.